Much has been written about Britain's unhappy relationship with the European Union, but although a referendum in looking increasingly likely in the next few years, the issues at stake are too often clouded in jargon and half-truths. This short and easy to read book sets out the main issues clearly and succinctly, spelling out the benefits of regaining our independence. 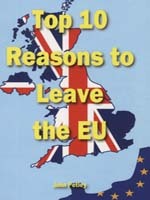 Ideal for anyone still in the dark about the EU or undecided how to vote if we are given the chance to regain our freedom.